Fire damage to this Raleigh home began in the kitchen with a stove top fire. While the fire damage was minimal due to the homeowner using an ABC extinguisher to subdue the blaze quickly, the soot and smoke damage managed to affect the entire house. 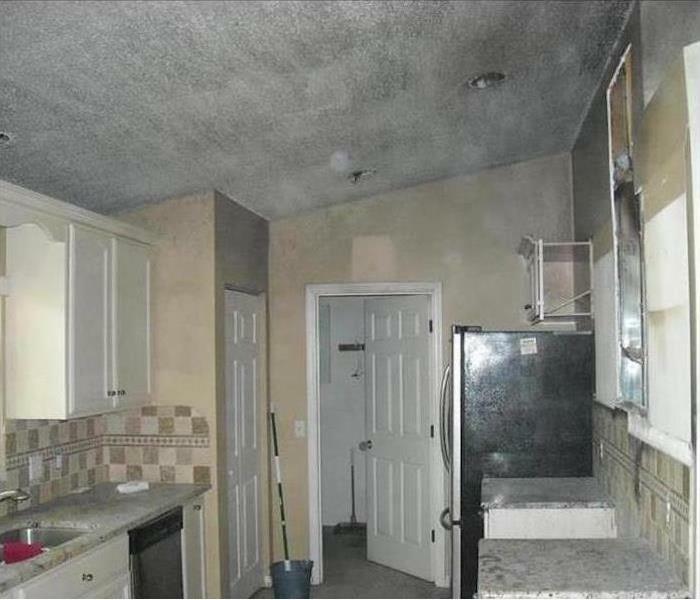 The photo shows the soot and smoke damage in the kitchen. What do you do if you have an unexpected water event? Call SERVPRO of North Raleigh & Wake Forest. We are available 24/7, 365 days per year. We have the equipment and expertise to remove the water and restore your property and make it "Like it never even happened." 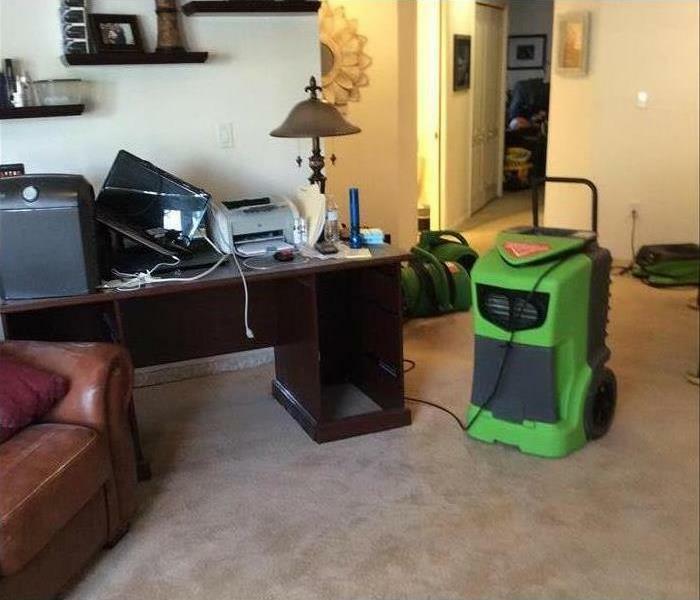 When water damage affects your home, your heating and cooling system can be affected as well. 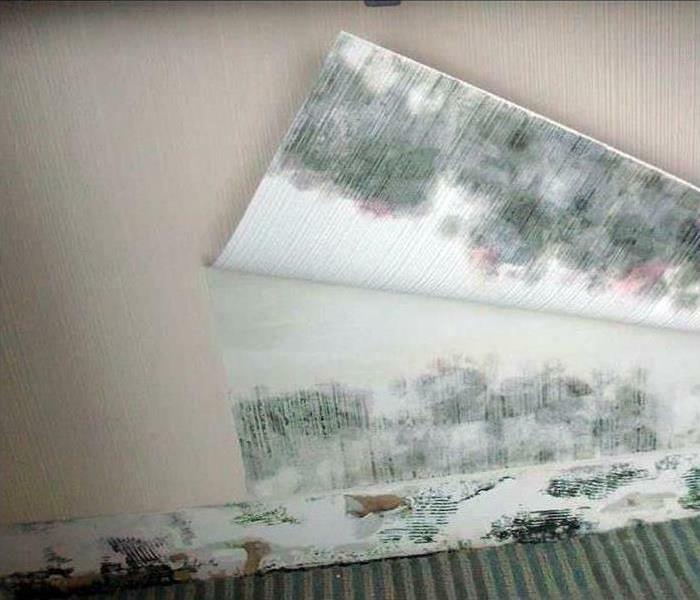 SERVPRO knows how to remove moisture so that you are not plagued with mold after the initial damage. We are IICRC certified and standing by to take your call after a damage event. Duct cleaning at your Raleigh residential or commercial property can become necessary and should be regularly scheduled to prevent poor air quality. Poor air quality from dirty ducts can be a health hazard to the occupants of the property. At the worst dirty ducts can lead to the development of mold. 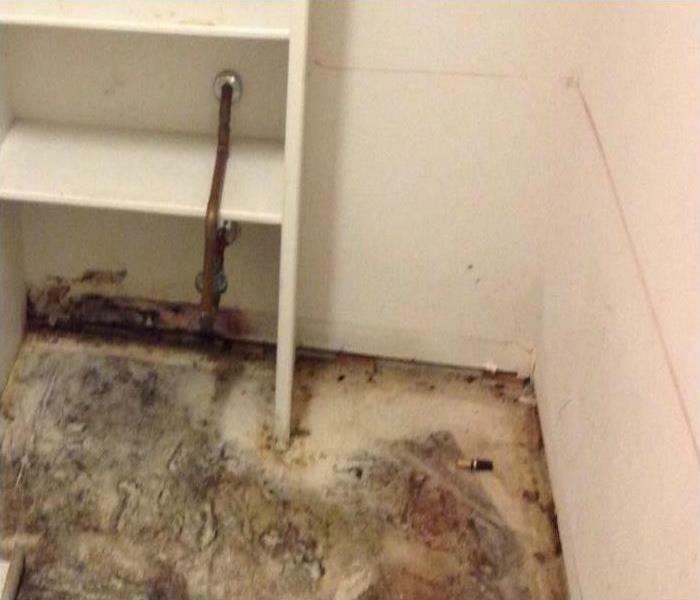 Water damage at this Raleigh home was caused by a leak from a bathroom water supply line. 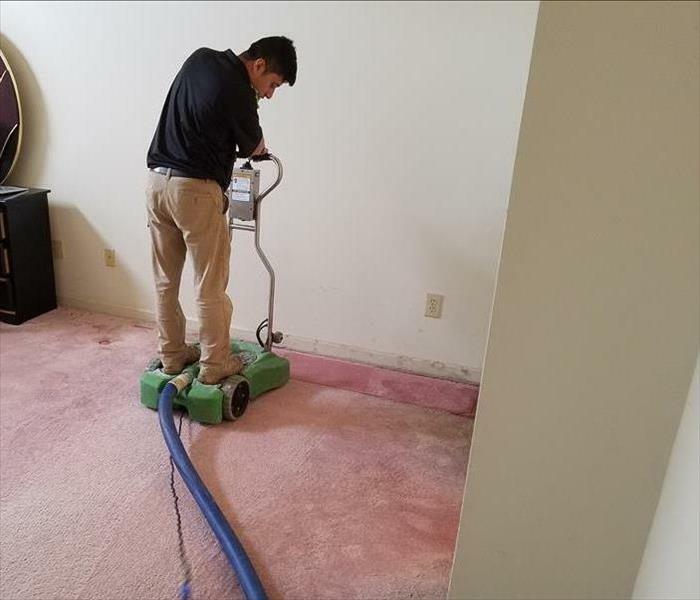 The leak led to wet carpeting which needed immediate attention to avoid permanent damage to the carpeting, padding, and subflooring. 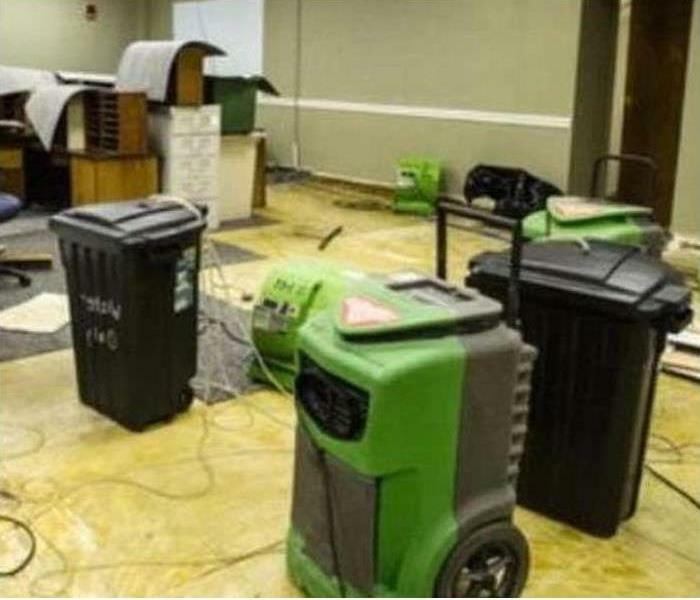 SERVPRO of North Raleigh & Wake Forest responds immediately to water damage events such as this to prevent lasting damage to the clients wet carpeting. How Will Hurricane Florence Impact Raleigh? As Hurricane Florence approaches and the track shifts there are a lot of questions regarding the local conditions in Raleigh. Florence is a very unique storm, to say the least. Experts see a lack of steering that makes the track of Florence uncertain after landfall. With Florence being a very large storm, tornadoes and gusty winds are possible especially south and east of Raleigh. Please monitor the local news to prepare properly and protect your family. 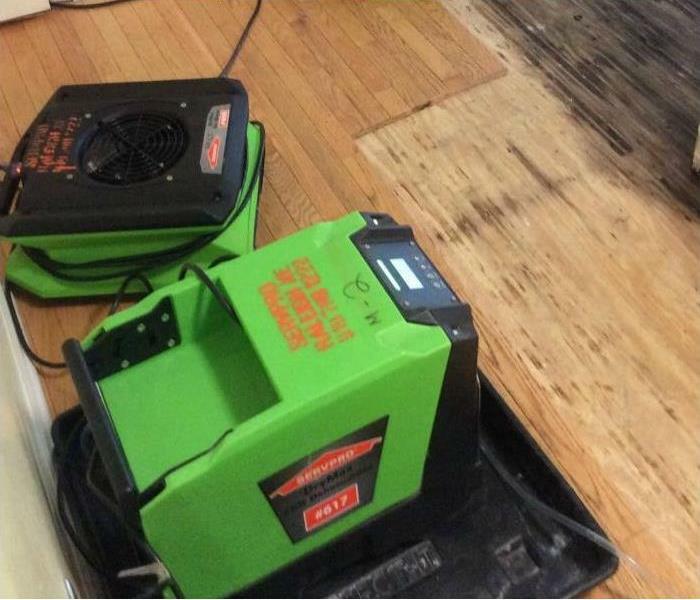 This Photo exemplifies and amplifies the skills of SERVPRO water damage restoration technicians. Hardwood floors that absorb water from kitchen mishaps in Raleigh need immediate attention for mitigating damages. After we vacuum up the standing water from the leaking dishwasher, we can focus on preserving the tongue and groove boards and the supporting floor joists. 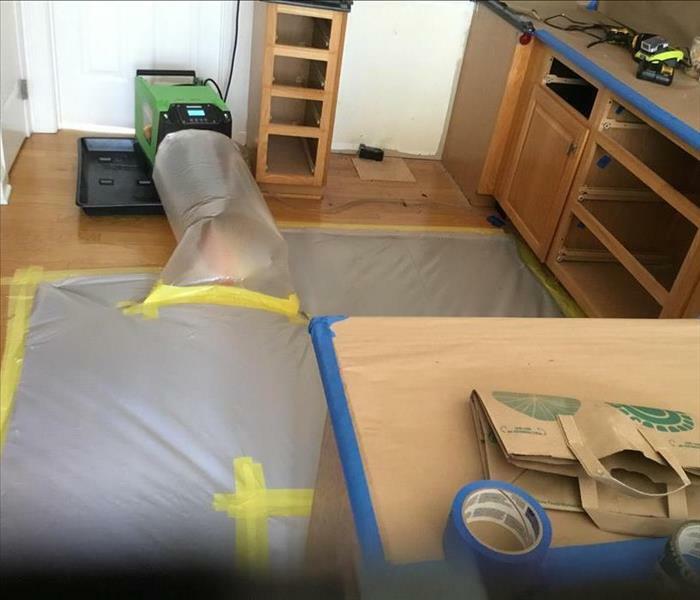 For maximizing the drying time and minimizing exposure to the effects of moisture, we taped plastic sheeting to seal the damp area and used lay-flat tubing connected to a heated dehumidifier. 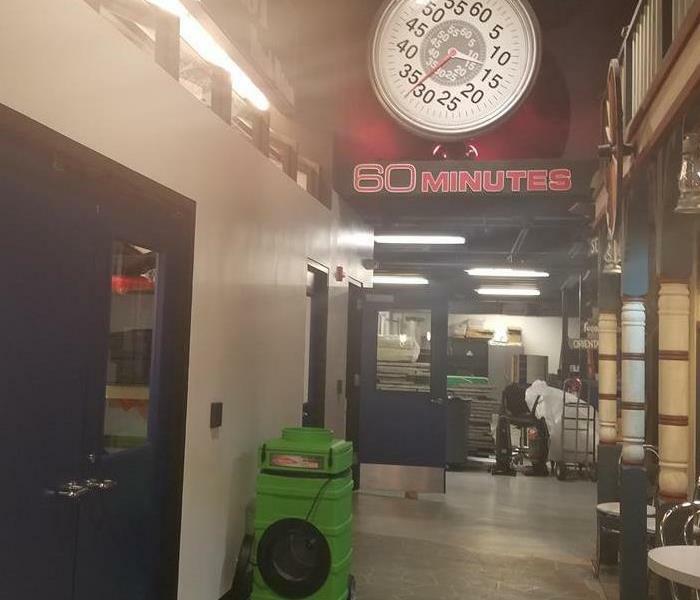 We carefully monitor the moisture content to prevent splitting of the boards and plan to remove the equipment once our drying goals have been achieved. Raleigh residents rely on the expertise of SERVPRO to respond quickly and make our customers feel "Like it never even happened." The storm damaged the roof allowing some water to enter this retail building in Wake Forest. 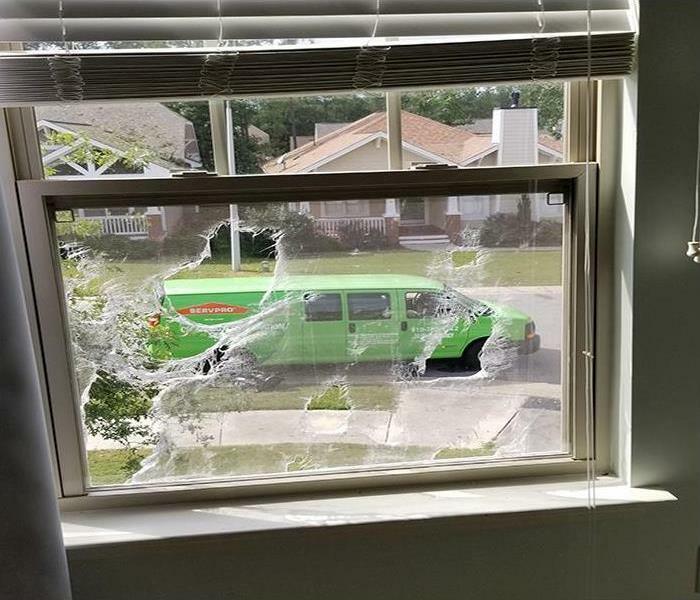 Savvy business managers know that a quick call to SERVPRO gets an even quicker response because We're Faster To Any Size Disaster. 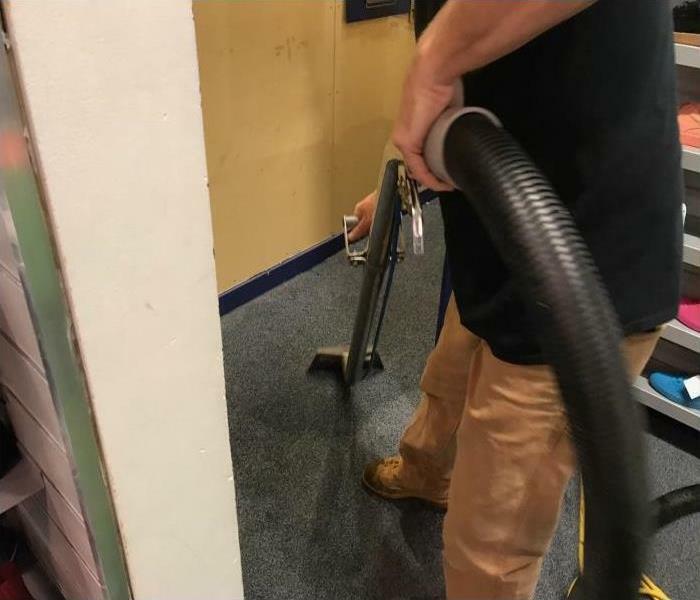 Using our industry leading air movers and dehumidifiers, we kept the store open with minor disruptions. Our team responded to a call regarding a fire that caused significant water damage to the property. The kitchen suffered water damage due to the sprinkler system, and it needed to be removed quickly. 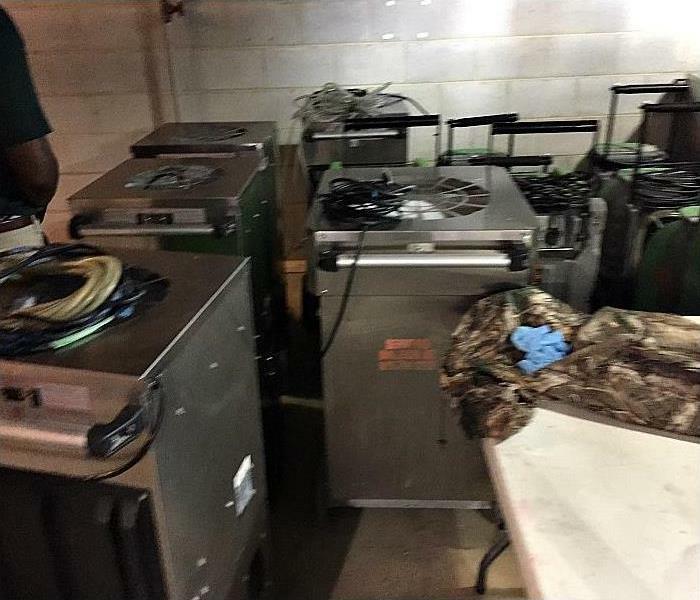 We used our specialized water inspection, extraction, and drying equipment to restore the property to pre-damage condition. Contact our team regarding any damage to your property. Keeping HVAC systems free of excessive pollen, pet dander, mold spores, and other contaminants for excellent IQA indoor air quality is crucial. Not only does it offer a cleaner and healthier environment for tenants of multi-unit buildings in the Raleigh area, but it extends the life of the capital investment. Why deal with offensive odors or possible mold infestations? Call SERVPRO for a free inspection to see if your system needs a good, professional cleaning. 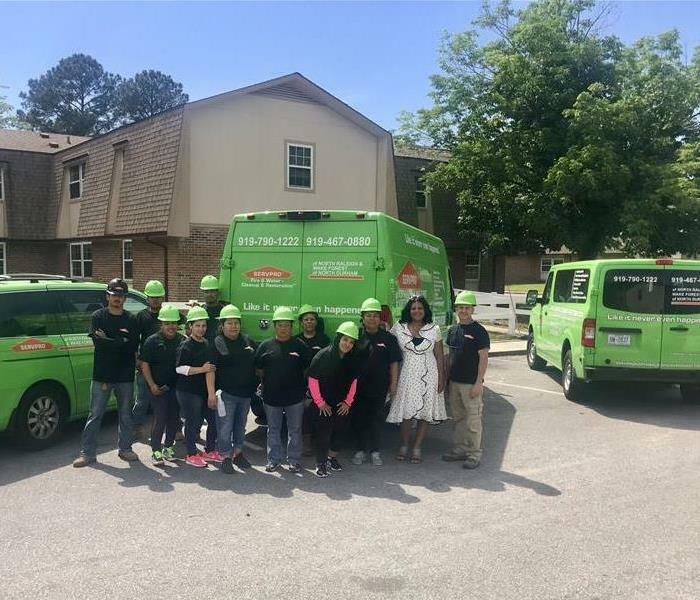 The homeowners of this Raleigh water damaged kitchen received instant relief when our SERVPRO Green Fleet rolled up soon after the call for help. 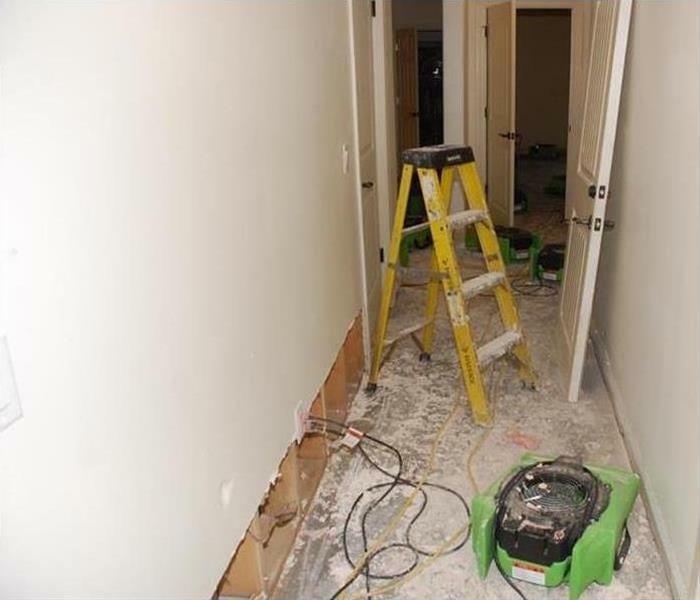 Our skilled technicians extracted the water and executed a partial demolition to mitigate the water damage. 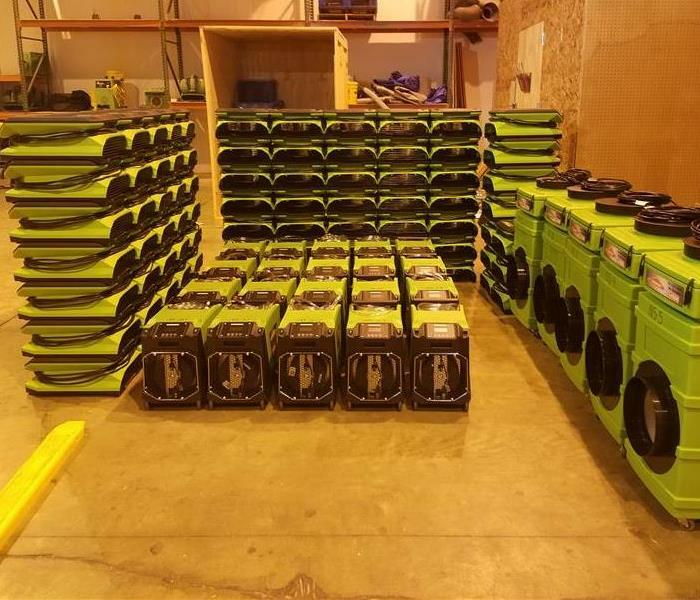 Our industry-leading air movers and dehumidifiers are busy drying out the area in preparation for a new kitchen. We're Faster To Any Size Disaster. 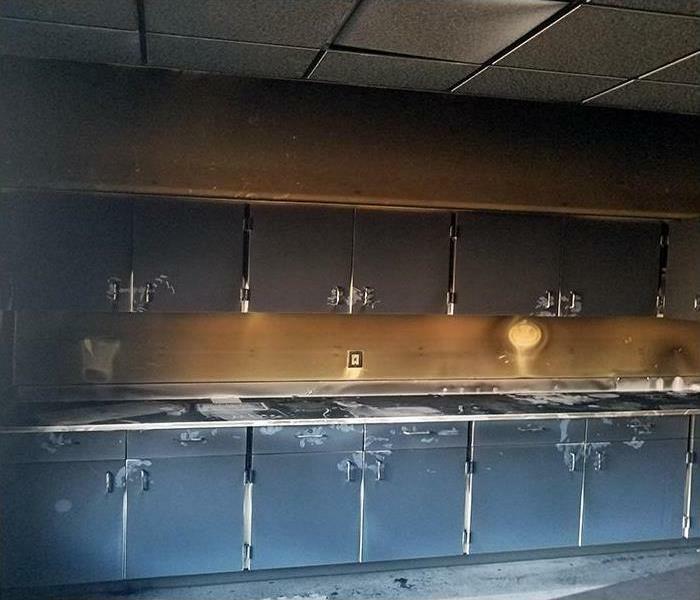 When a fire struck this church in Raleigh, our SERVPRO team arrived quickly to mitigate the fire & smoke damage. The kitchen was the culprit damaging some building materials as depicted by the dumpster. The smoke wipe-down and odor removal using our industry-leading equipment limited the interruption to the weekly routines of the church. We proudly serve our communities the best we can. Did You Suffer Commercial Water or Flood Damage in the Raleigh Durham Area? 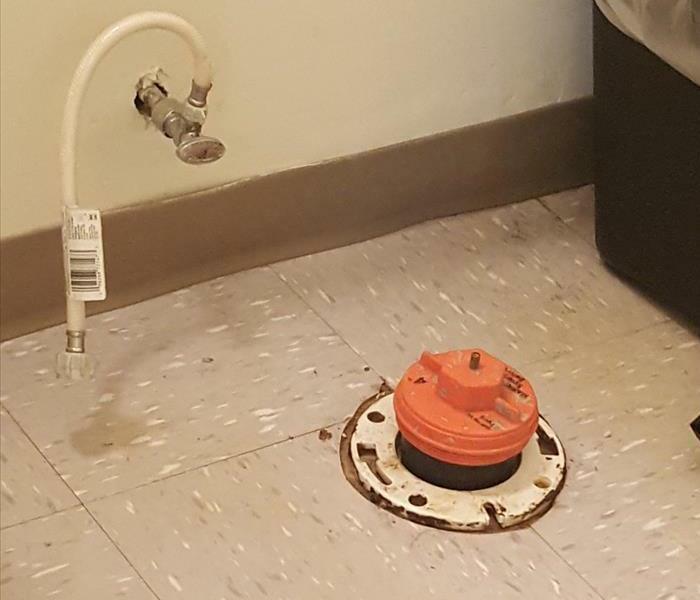 Commercial clients are always thrilled with our fast response to emergency water intrusions to their places of business. We can provide these enterprises with our ERP, Emergency READY Profile Program, which is a mobile app that stores contact information, sensitive pressure points at the facility, and helps to mitigate damages. But you still need boots on the ground with the right equipment to minimize downtime. 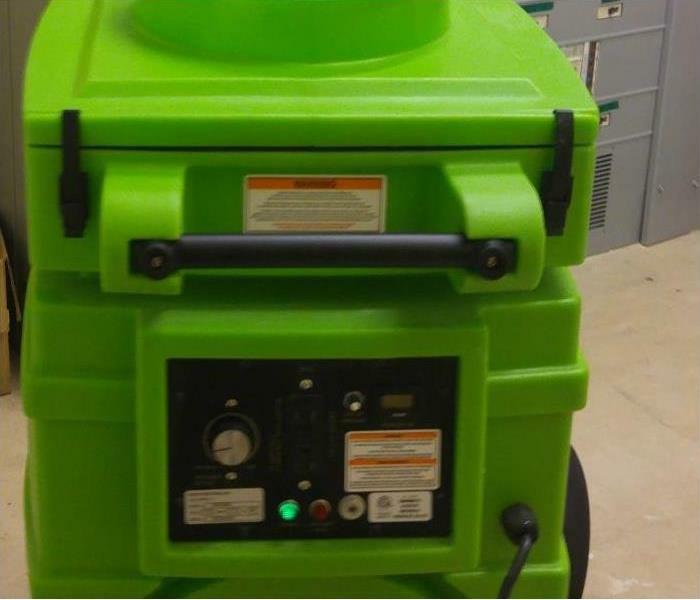 Pictured is the newest state-of-the-art compact air movers that help to dry out our customers buildings. SERVPRO of North Raleigh & Wake Forest is always swiftly on the scene to help. A church in Raleigh contacted us about a fire damage incident. The property suffered significant fire and smoke damage. Our highly trained technicians will use specialized techniques and equipment to remove the soot and smoke from the walls, ceiling, and other surfaces. They will also use a variety of cleaning techniques to restore the structure and restorable items to pre-damage condition. If your property has experienced a fire in the Raleigh and Wake Forest area, you can contact the professionals at SERVPRO for assistance (919) 790-1222. 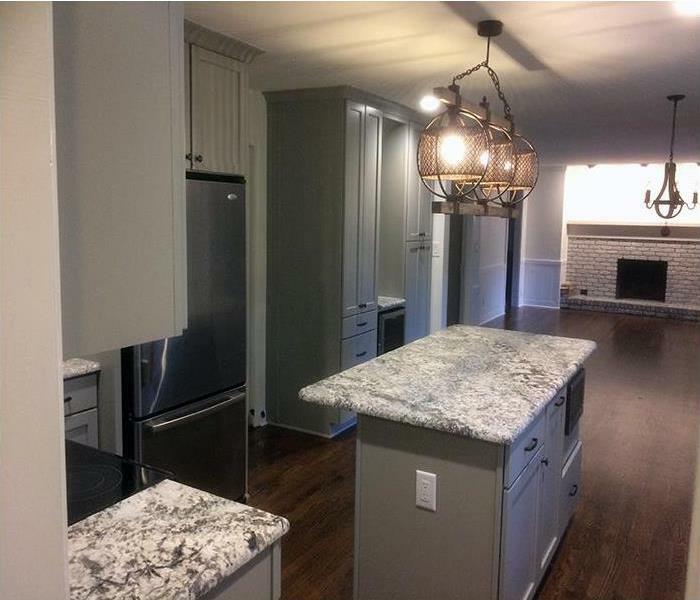 Our team was able to fully restore this residential property that suffered from significant water and flood damage. Thanks to our highly trained technicians you would not be able to tell there was any damage. We made the restoration process simple by handling both the water damage mitigation and rebuilding the damaged area. 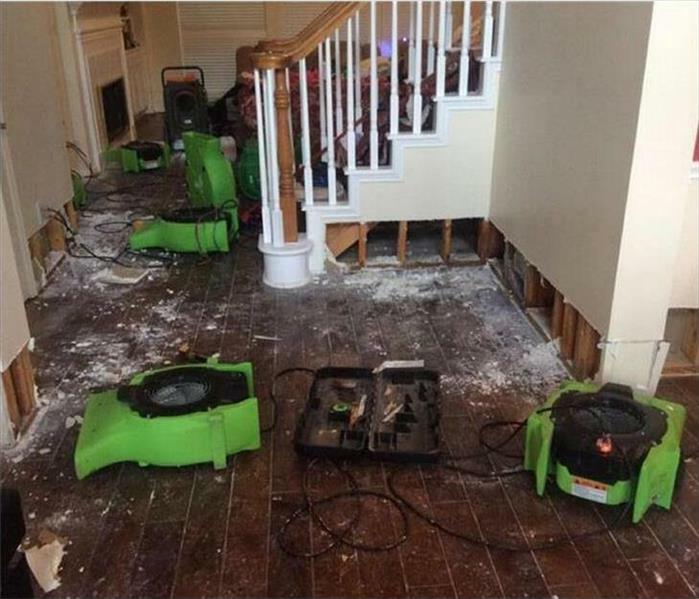 When dealing with water or flood damage in Raleigh and Wake Forest call the experts at SERVPRO. Our local team of restoration professionals are ready to help you. 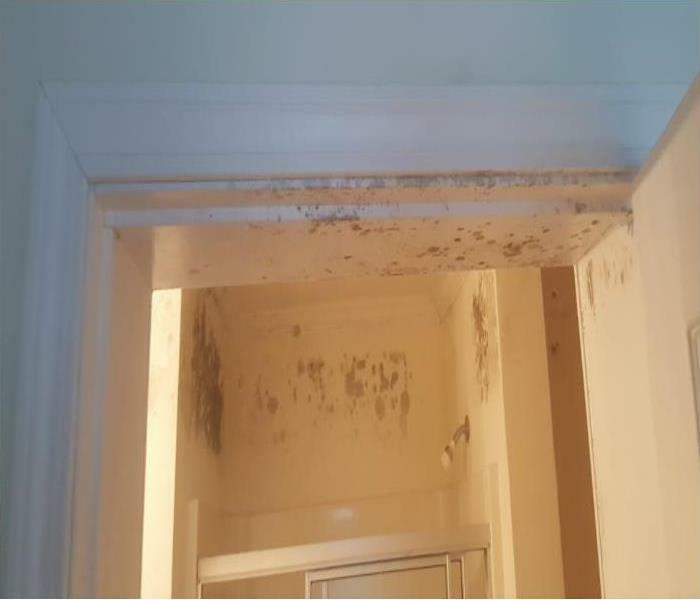 This area of the Wake Forest structure was infested with mold brought on by a water leak. 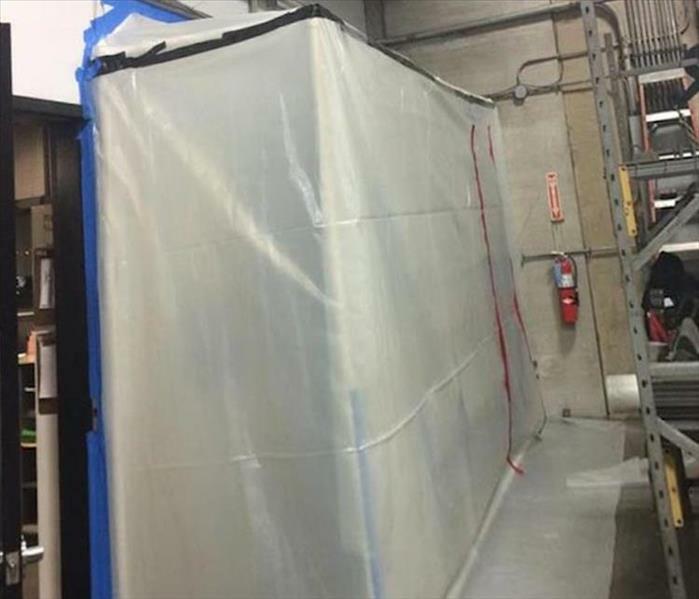 The skilled SERVPRO technician contained the contaminated area to prevent the circulation of airborne mold spores. Negative air pressure was also utilized during this mold remediation job. This technique allowed the warehousing of inventory to continue without interruption. The damage on the walls from the storm water was limited because of the tear out. Only several feet of drywall needed replacing due to the fast arrival and water removal performed by our SERVPRO technicians. We work hard to save you money and inconveniences. The water fed the mold spores in the ceiling cavity of this New Hope home leading to the mold staining visible on the ceiling and walls. 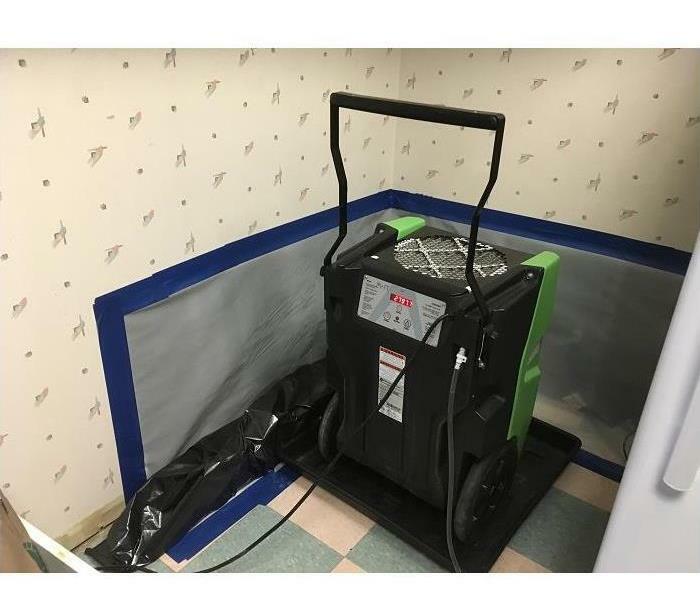 After finding the leak, our SERVPRO AMRT team set up a containment zone to prevent the spread of mold spores to unaffected regions of the house. The photo illustrates the damage caused by heat and smoke from a fire at this Raleigh home. Our SERVPRO crew quickly tore out the charred building elements, exposing the fried electrical system. This project can be completed promptly with our skilled FST technicians. Commercial water damage struck this Raleigh office building when main water line burst. The water damage to the flooring was extreme, and our instruments indicated the subfloor had retained significant moisture. We had to tear up the carpeting and padding to properly dry the subfloor. Water damage was incurred by this Raleigh home when a pipe within the walls burst. The flooring was thoroughly soaked, and our instruments were telling us the subfloor had sustained too much water damage to dry through the flooring material, so we tore up the carpeting and padding to allow us to dry the subfloor adequately. 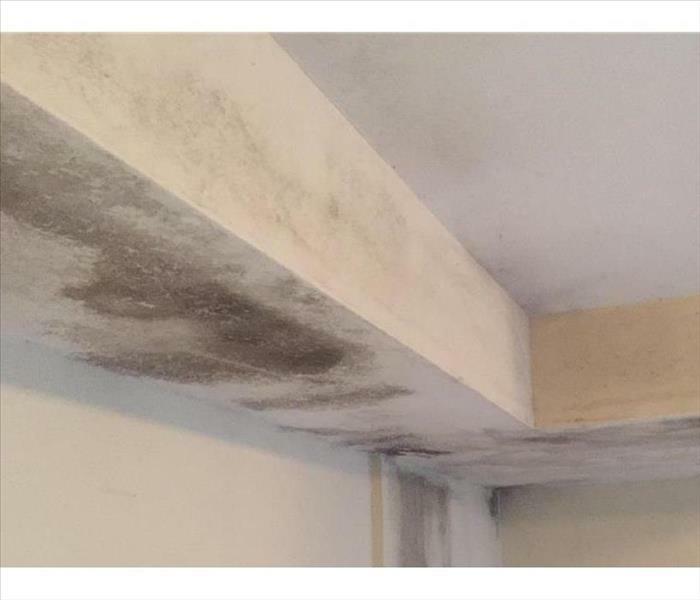 Mold damage developed in the air conditioning closet of this Raleigh home due to an old air handler dripping condensation allowing a large mold colony to develop. WE replaced the flooring and cleaned and disinfected the closet and the HVAC system to help prevent any recurrence of mold problems. A short in the wall of this Wake Forest home caused quite a mess. The demolition was necessary to ensure the cleanup would be thorough and allow for full restoration. 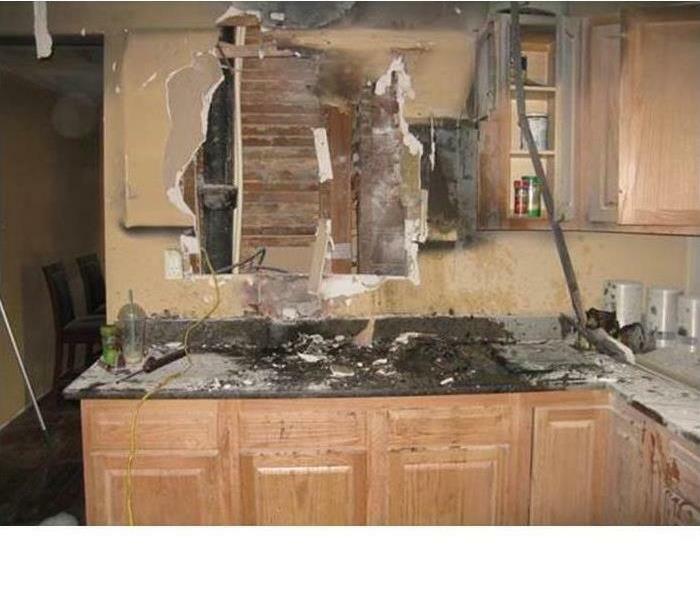 SERVPRO team members can restore this kitchen in several days. Pooling water not removed quickly can result in cupping and warping of hardwood flooring. 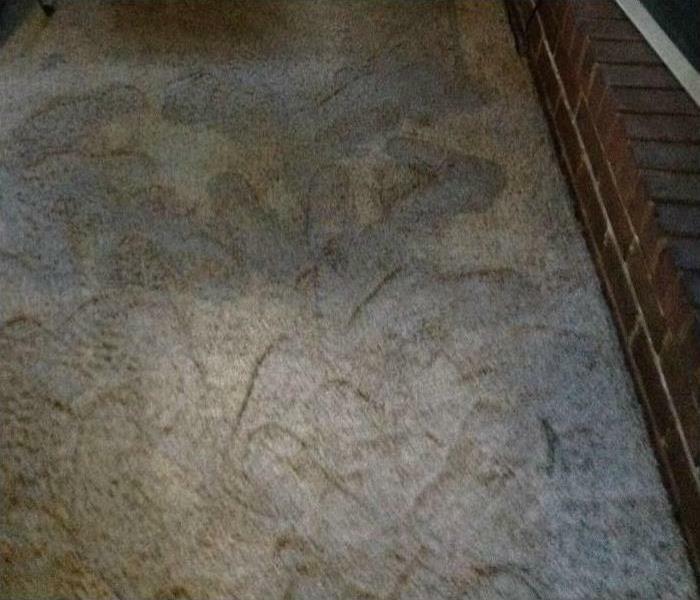 This North Raleigh home was unoccupied over a weekend, and the photo illustrates the result of the water. 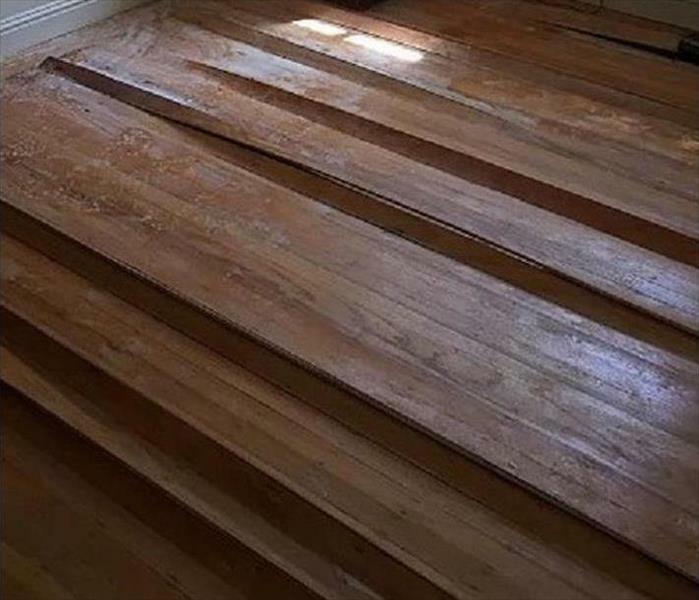 SERVPRO can lift the flooring planks, dry out the supporting floor joists, and try to reinstall the hardwoods. 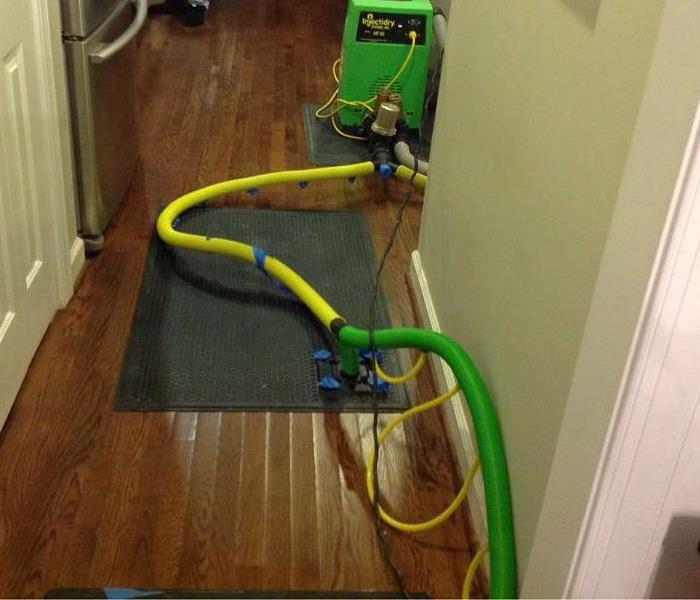 Here our technician is extracting water after a commercial water damage in Raleigh, NC. If you have commercial needs call 919-790-1222 today. This picture depicts our technicians staging for a commercial multi-unit job in Raleigh, NC. 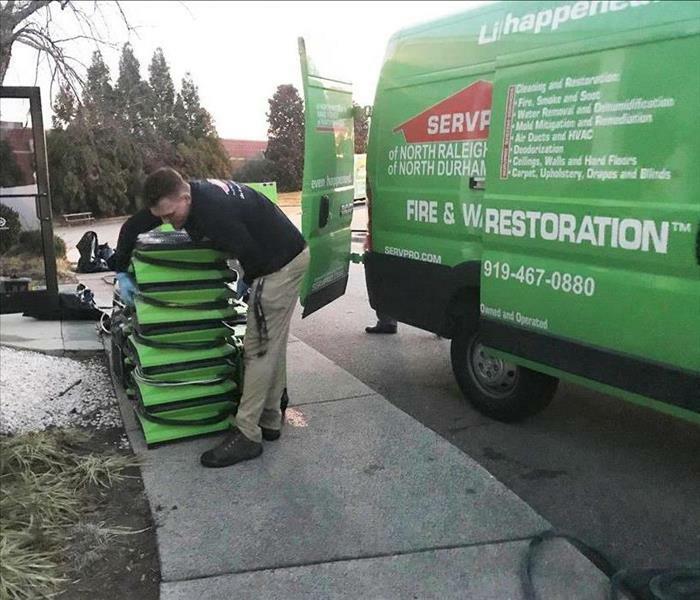 SERVPRO® of North Raleigh & Wake Forest has the experience and equipment needed to respond quickly to any-sized disaster. 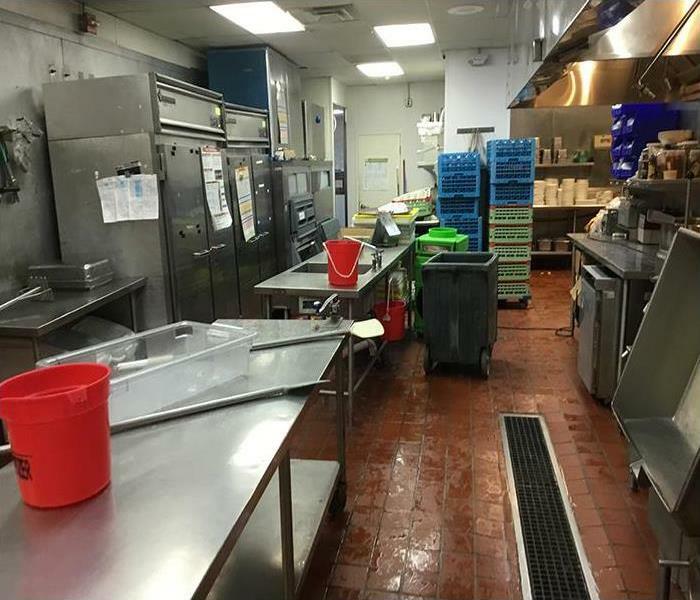 This business in Apex, NC experienced a leak affecting several rooms from a neighboring unit. The business owner was pleased with how quickly our technicians were able to respond and begin mitigating the damage. 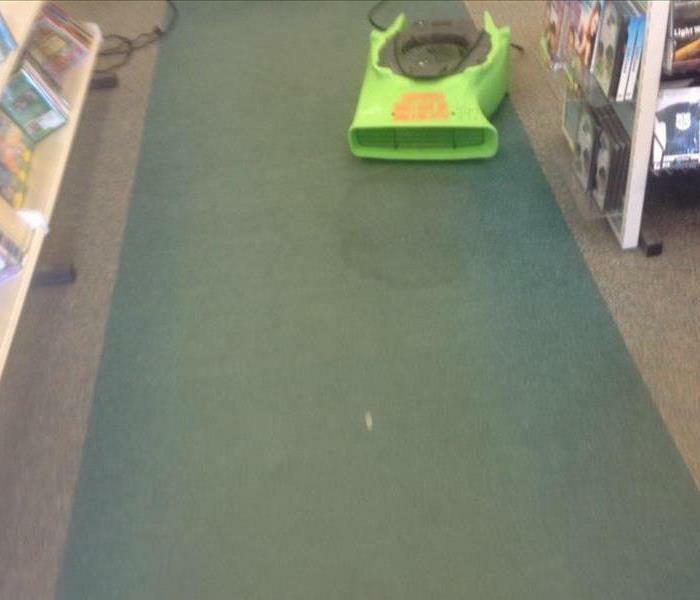 This bookstore located in North Raleigh, NC experienced water damage as a result of a leaky roof. Our certified technicians were able to use their expertise and equipment to remediate the problem without loss of business operations. 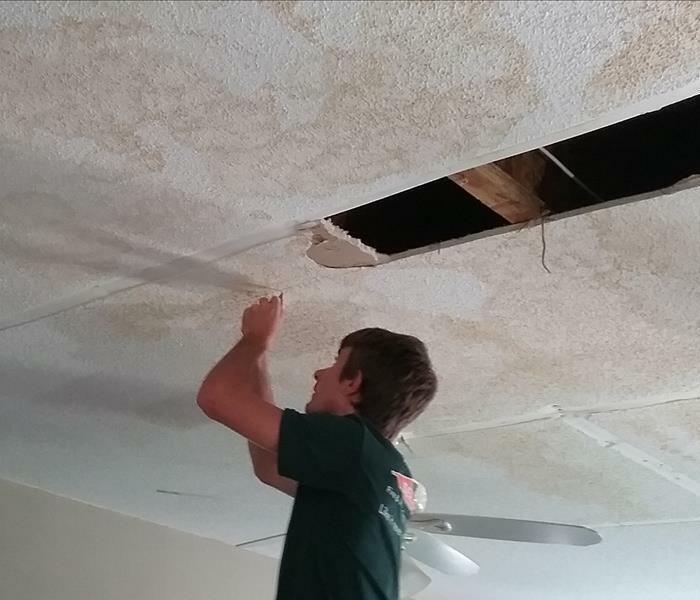 Even in the midst of a home damaged by storm waters, our technicians take the time to care. 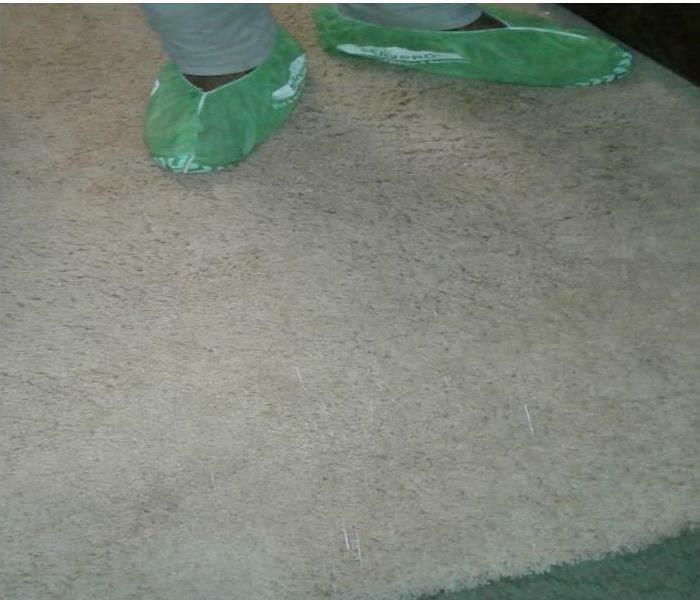 Pictured here is a technician wearing protective booties while in a homeowner's residence. Storm and flood damage require specialized restoration techniques and equipment. When a storm hits your North Raleigh and Wake Forest home, you need the company with storm damage experience and expertise. SERVPRO of North Raleigh and Wake Forest can respond immediately to storm and flooding conditions. 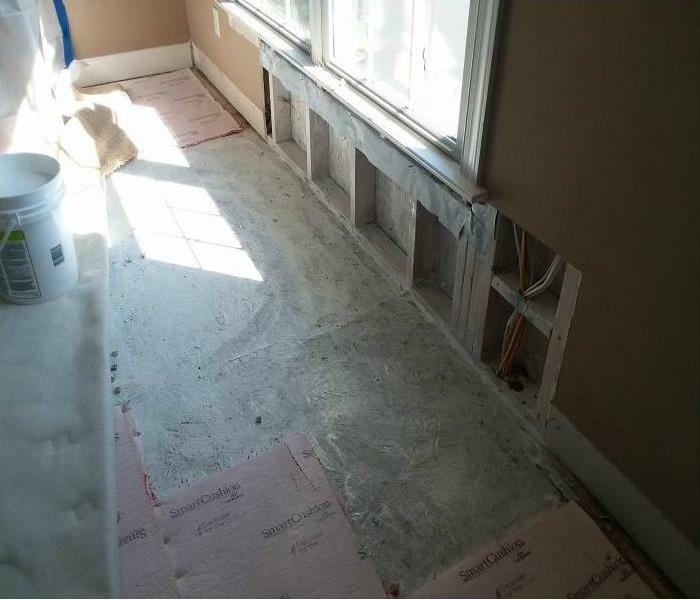 This finished basement in Raleigh, NC experienced flooding from a major storm in April 2017. The carpet had to be pulled back as part of the drying process. This kitchen floor in Raleigh, NC had so much damage from the storm the floor begin to buckle. After a storm event in April 2017, this North Raleigh kitchen had to have some of the flooring removed in order to complete drying. 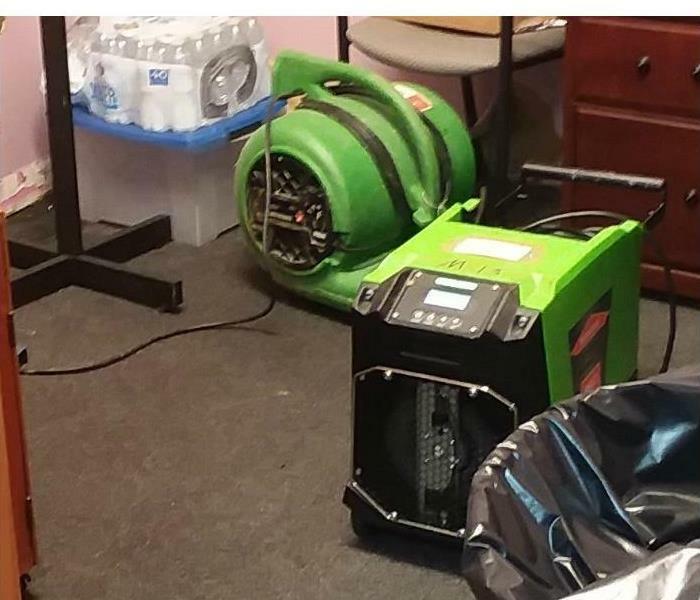 Several pieces of equipment were used, including the pictured dehumidifier and airmover. 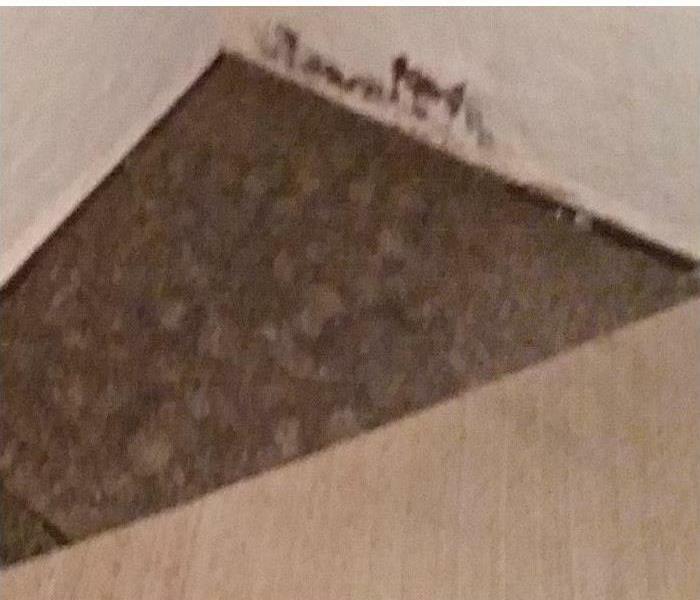 This master closet in Raleigh, NC had mold under the carpet and padding which had to be removed in order to be properly remediated. Any home or commercial property can quickly become infested with mold if a source of water is present. Mold can spread throughout a property in as little as 48 hours. Since mold can produce allergens and irritants, you should call us to inspect your North Raleigh or Wake Forest home if you suspect you have a mold problem. If mold is found, we have the training, equipment, and expertise to remediate your mold infestation. Rain entered through an open window causing mold growth on the wall beneath the window and the floor. Here our team used a process known as encapsulation as part of the remediation process. After prolonged exposure to moisture mold formed in this North Raleigh, NC crawlspace. 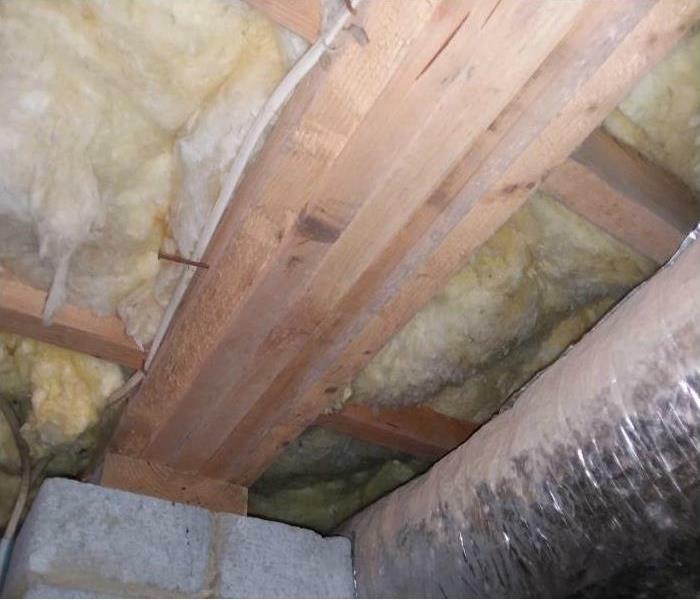 Our certified technicians were able to remove the insulation and remediate the crawlspace to the homeowner's satisfaction. Mold needs a warm climate and moisture to grow, as shown in this bathroom in Apex, NC. Our certified technicians were able to remediate the situation in minimal time making the home safe again. Pictured here is a piece of specialty equipment, called an airscrubber in use after a fire. Its job is to remove gasses, chemicals, and particles from the air. Fire, smoke, and soot damage requires specialized restoration techniques and equipment. 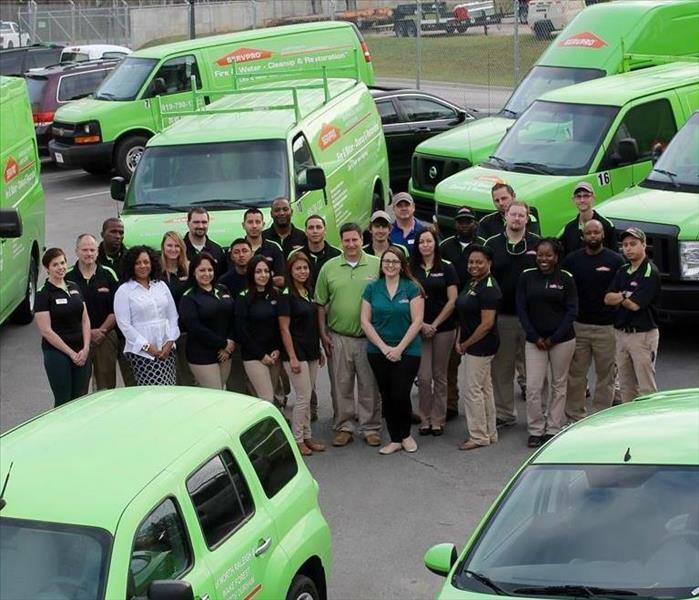 Our SERVPRO® of North Raleigh & Wake Forest technicians are highly trained. From initial and ongoing training at SERVPRO's corporate training facility to regular IICRC Industry certifications, our technicians are equipped with the knowledge to restore your property. 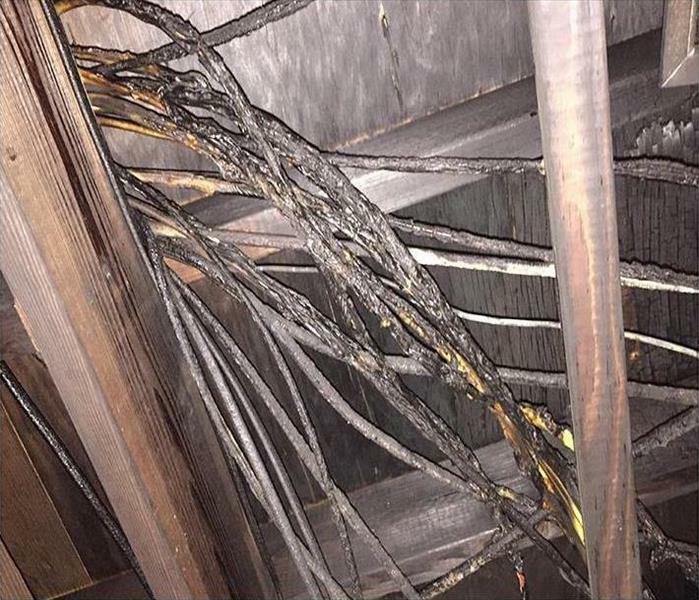 An electrical fire started in this electrical room. 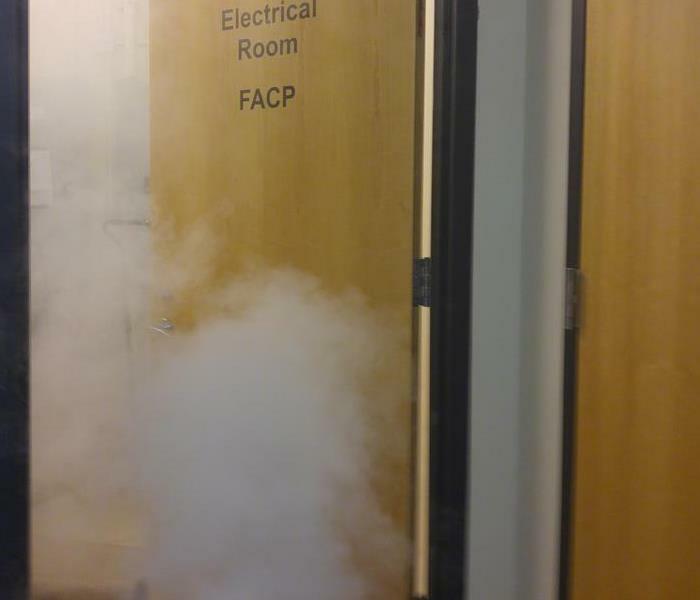 The smoke is a result of fogging to remove odors. Fire, smoke, and soot damage requires specialized restoration techniques and equpiment. 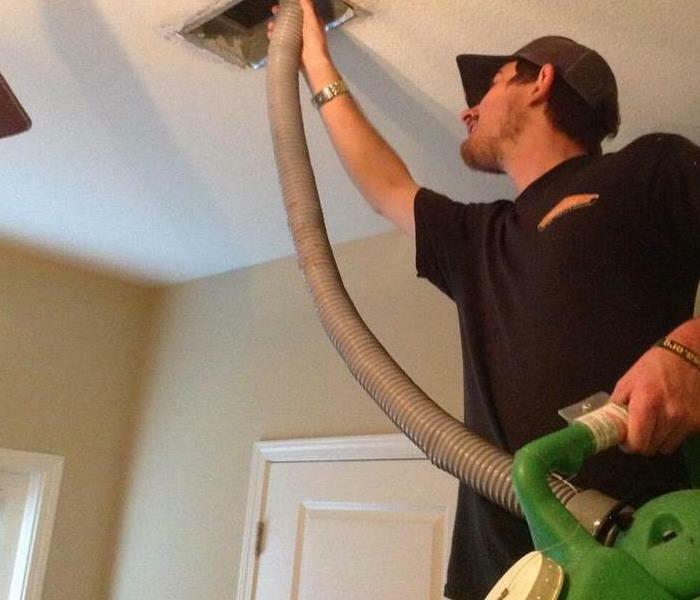 Our SERVPRO® of North Raleigh & Wake Forest technicians are highly trained. From initial and ongoing training at SERVPRO's corporate training facility to regular IICRC Industry certifications, our technicians are equipped with the knowledge to restore your property. 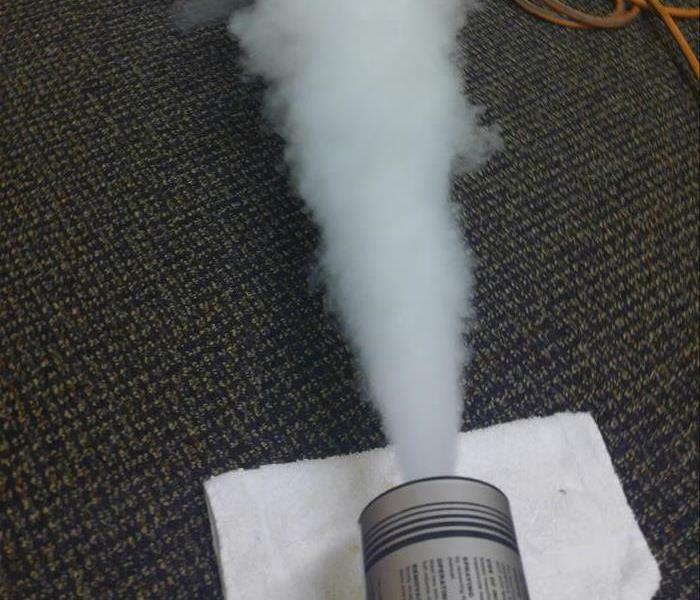 This is an example of a thermal fog. Our certified technicians used this process after an electrical fire to remove odors. Have questions about fire, smoke, or soot damage? Call Us Today 919-790-1222! This North Raleigh, NC home had a flooded basement as a result of a storm event in April 2017. 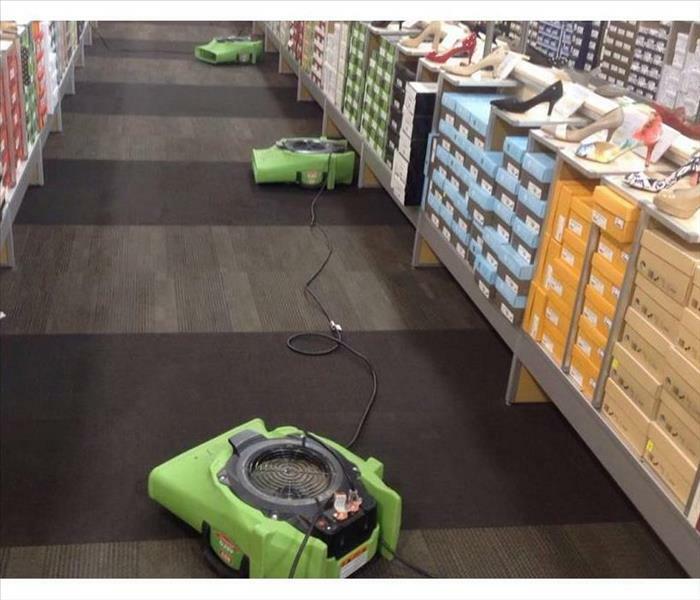 This photo shows the deep saturation of water in the carpet. 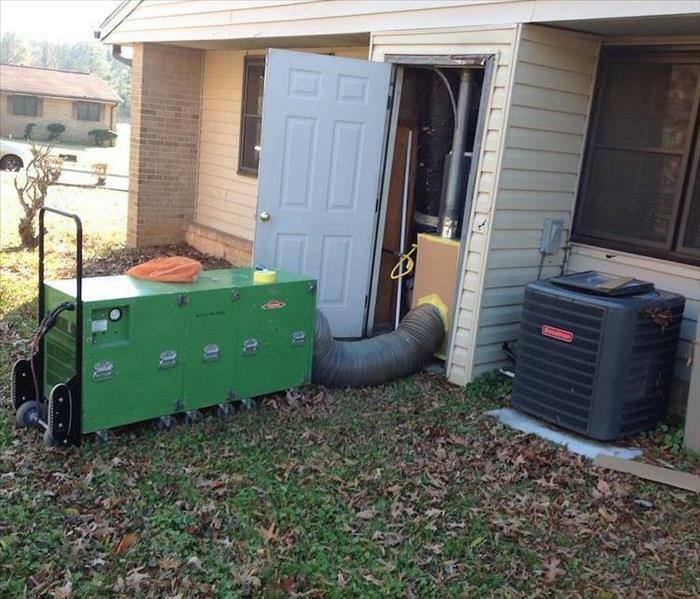 One of the ways SERVPRO® of North Raleigh & Wake Forest is faster to any-sized disaster is by being prepared. Here is a picture of the new equipment delivered to our warehouse. Helping us stay prepared, to help you, when you need us most. Here a business suffered from a water loss due to a toilet that overflowed. Our team was able to arrive onsite quickly, and mitigate the water damages, which had migrated outside the tile bathroom and onto the carpeted hallway. 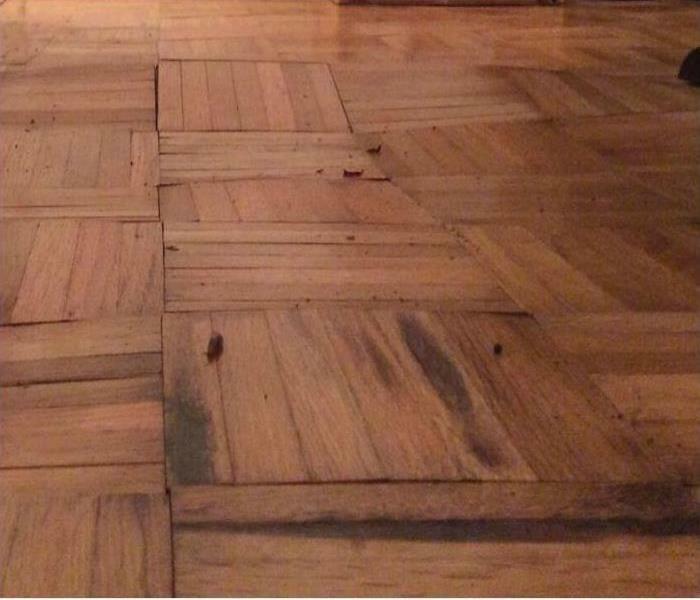 This homeowner experienced a water loss that had the potential to ruin their beautiful hardwood floors. Our technicians used a specialty mat drying system to save the flooring. "Like it never even happened." 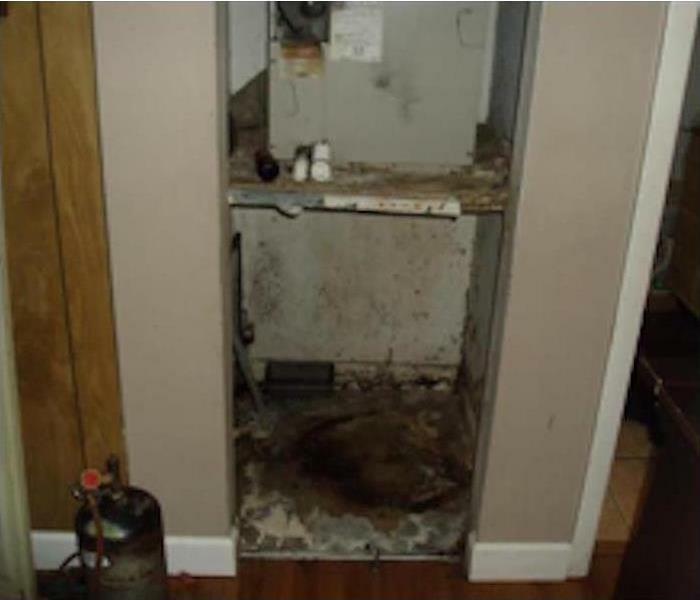 This homeowner experienced a significant water loss from an upstairs bathroom sink overflow. This required not only drying the flooring of the affected room, but also the ceiling from below. Here our technician is cutting the ceiling to prepare a cavity for containment. This was the aftermath of a commercial dryer fire in Cary, NC when we arrived on the scene. Note the significant smoke and soot damage. Our technicians worked quickly to make the site operational again. Our technicians use numerous types of equipment to dry out your home. Here a technician is using a stand-on rover to extract water from a customer's living quarters. At SERVPRO® North Raleigh & Wake Forest we're proud to have invested in a state-of-the-art vault system. 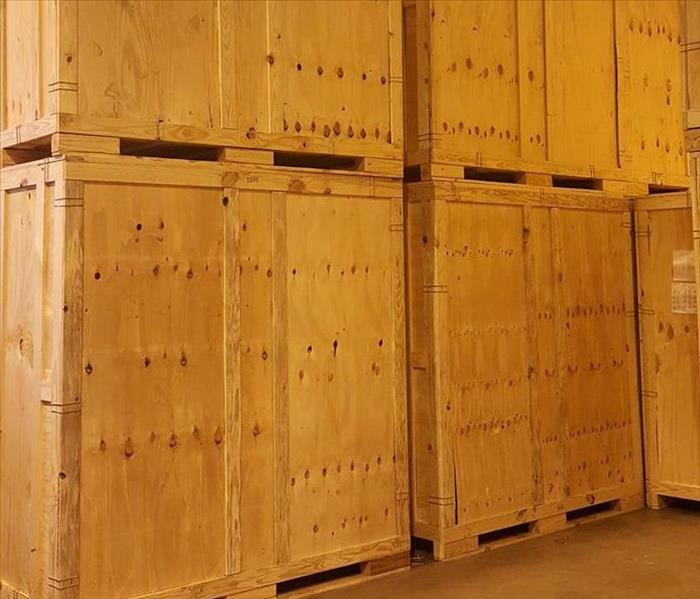 Our spacious 6,500sqft warehouse allows us to individually secure our customer's belongings on the premises.